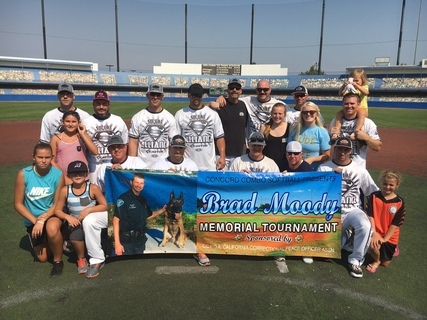 On August 19th and 20th, 2016, Cali Force hosted the 7th annual Brad Moody Memorial Tournament at the Big League Dreams in Manteca, California. We had 13 teams battle it out. Six teams in “A” flight and seven teams in “B” flight. 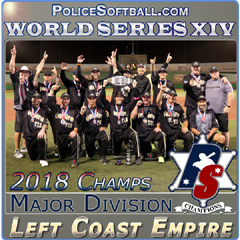 The following teams attended; Cali Force, Stanislaus, Alliance, West Coast United, Cen Cal Connection, Nor-Cal Elite, El Dorado Cartel, Degenerates, DVI Gladiators, Most Wanted, Richmond PD, Oakland PD and Nor Cal Warriors. Thank you to all the teams that attended. The weather was +/- 92 degrees for both days. The balls were flying (Baden 44 core and 375 compression). 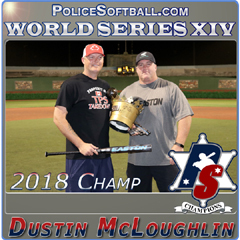 Thanks to Policesoftball.com for lending the Easton Bats. Those bats appear to be well broken in. Round Robin games were mixed with “A” and “B” flight teams. 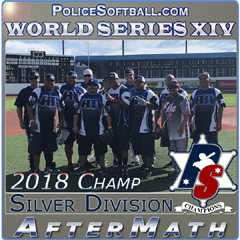 For the 2nd year in a row, there was a upset with Richmond PD beating Cali Force. After round robin the following “A” fight teams were seeded 1-6 in this order; Alliance, Stanislaus, Nor Cal Elite, Cen Cal Connection, Cali Force and West Coast United. 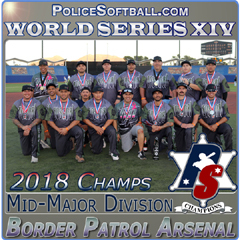 After round robin the following “B” flight teams were seeded 1-7 in this order; Richmond PD, Nor Cal Warriors, DVI, Oakland PD, Degenerates, El Dorado and Most Wanted. 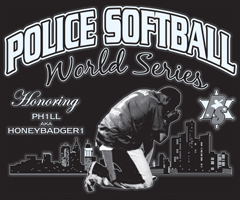 In between round robin and playoff games, a memorial celebrating the life of Brad Moody and all the police officers that have paid the ultimate sacrifice was attended by most players playing in the tournament. This ceremony took place on Tiger Stadium. The Moody Family; Brad’s mother Betty, Brad’s Wife Susan, Brad’s brother James (Richmond Police Officer) and Brad’s daughters Emma and Madison Moody. Jen Moody (Brad’s Sister) was not able to make the tourney this year. Emma and Madison each threw out the ceremonial first pitch. Stanislaus’ Honor Guard posted the colors and also had a bagpiper playing during the ceremony. This was very emotional and a outstanding way to honor Brad Moody and all the fallen officers who paid the ultimate sacrifice. Stanislaus had a helicopter do a fly over Tiger Stadium during the ceremony. A big thanks to Stanislaus County S.O. for providing their services. A big thanks to the retired Under Sheriff (Mick Hardenbrook) of Stanislaus S.O. for making this happen. I know I got tears in my eye and got a little chocked up. The Moody Family was very happy how we honored Brad and all the fallen officers. Once again, the Moody girls will be receiving proceeds from this tourney. A big thanks to Tyson Becker and Ralph Contreras for purchasing the Moody Tee Shirts out of their own pocket and donating the money collected for Emma and Madison Moody. They raised approximately $1375.00 for the girls back to school shopping fund. You should have seen the smiles on their faces when I announced it during the ceremony. In “A” flight 1st round playoffs, Cen Cal Connection beat Cali Force and West Coast United beat Nor Cal Elite. In the 2nd round of the playoffs, Alliance beat Cen Cal Connection and West Coast United beat Stanislaus. On Saturday morning, Cen Cal Connection got a bye when Nor Cal Elite was unable to field a team. Stanislaus put Cali Force out of the tourney with a 23-13 win. In the undefeated game, Alliance Beat West Coast United 26-18. That would drop West Coast United to the losers bracket playing Stanislaus. Stanislaus beat West Coast United 24-14. That would set up the championship game. In the end, Alliance beat Stanislaus 20-16. It was a very good game that went back and forth. Alliance’s MVP is Bryan Schmidt. All tourneys are Keith Habig, Danny Wells and Shawn Michels. Stanislaus’ MVP is Johnny Lopez. All tourneys are Kevin McCarthy, James McCarthy and Freddie Nevarez. Congrats to the MVP’s and the all tourneys. Congrats to Alliance and Stanislaus for a great championship game. In “B” flight 1st round playoffs, Degenerates beat Oakland PD, El Dorado Cartel beat DVI and the Nor Cal Warriors beat Most Wanted. In the 2nd round of the playoffs, the degenerates beat Richmond PD who drew a 1st round bye. El Dorado Cartel beat the Nor Cal Warriors. In the losers bracket, Most Wanted beat DVI. That would set up Richmond PD VS Most Wanted and Oakland PD VS the Nor Cal Warriors. 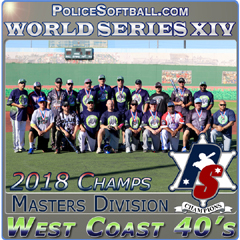 Most Wanted beat Richmond PD and the Nor Cal Warriors beat Oakland PD. The next round, Most Wanted knocked the Nor Cal Warriors out of the tourney. In the undefeated game, El Dorado Cartel beat the Degenerates. That would set up Most Wanted VS the Degenerates. Degenerates beat most wanted in a great game 24-23. That would set up the championship game between El Dorado Cartel and the Degenerate with El Dorado Cartel in the driver’s seat. After 8 innings and with two out, El Dorado Cartel Beat the Degenerates 16-15. El Dorado Cartel player Colby hit an inside the parker to win the game. El Dorado Cartel’s MVP is Joe Johnson. All tourneys are Sam Rose, Abel Tenorio and Teddy Starr. Degenerates MVP is Wayne Repard. All tourneys are Norm Sells, Roy Tatum and John Savage. Congrats to the El Dorado Cartel and Degenerates on a great championship game that went 8 innings. 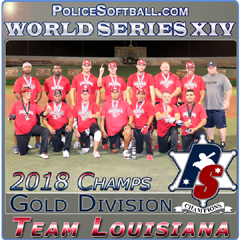 I would like to thank the Stanislaus County Sheriff’s Office for lending their resources to make the Moody Tourney special for the Moody Family, all the players and family members who attended. I would also like to thank Dan Potter and his umpire crew. They did another outstanding job. Dan thanks for making my job easy while making this tourney run very smoothly. The Moody family really appreciated the way the players honored Brad. The family received many hugs during this event. The Moody Family said they will never forget how we honored their son/husband/brother and father. A big thanks to the Alliance for traveling from Southern California to play in the Moody Tourney. I hope in the future that we can get more Southern California Teams. I feel the Moody Ceremony is very special to the Moody Family and all the players who attended. I got most of the ideas for the ceremony from the Sterling Heights tourney in Michigan. This is one of the best tourneys that I have had the pleasure to play at. They sure know how to honor Wouters/Sawyers and all the police officers that have paid the ultimate sacrifice. Thanks again to the teams who committed and played in the 7th annual Brad Moody Memorial Tourney.